Pugs may not exactly look the part of the Court Jester with their squashed-up faces and flattened features, but they are fun little dogs possessed of a keen sense of humour and a loving nature. Bred as lap dogs during the Shang Dynasty in Eastern China around 400 BC, they are tough litte dogs despite their diminutive size. More than most dogs, the Pug is capable of adapting its mood to that of its owner, making it a companion dog in the truest sense of the term. Looking after and caring for Pugs is very important. 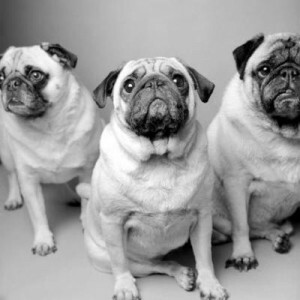 If you’d like to know more about health issues affecting Pugs, check out the known health concerns here: Pugs Health. Find Pug Breeders. My 5 and a half month old baby pug has just been to the vets and has a suspected complex case of hemivertebrae, Im so upset and beside myself, I can’t stop crying. Absolutely…. Just so upsetting, especially researching it on the Internet. I just need to know if there is anything I can do… Luckily Milo doesn’t seem to be in any pain, but it’s so worrying that it is going to get worse and it might result in severe pain. I’ve read about surgery… Which is a lot of money and only 50/50. We have been referred to a neurologist for in a weeks time. Until then we have been advised to keep him confined to his cage – which is worrying in itself as his personality has not changed at all and he is so lively and always wants to play! He is not incontinent at all, but he is wobbly on his hind legs, drags his back feet and at the vets, she established he could not feel pain all along his back. I just feel I need to do something.